Our sincere congratulations on your new showroom in Lake Forest! Can you share with us the thought behind opening your doors? What can one expect to find? Opening Shelley Johnstone Design Studio and Showroom was completely serendipitous. The business has been growing rapidly and we were in need of more space to meet with our clients, inventory product and materials, demonstrate our aesthetic and host lifestyle events. This wonderful space in beautiful downtown Lake Forest, just a couple of blocks walk from my home, became available. We converted the street level space into The Showroom. Sisal carpet, upholstered walls and tinted blue ceiling are just of the few design elements we added to make it feel like home. The Showroom is filled with all our favorite things, curated pieces of art, furnishings, pillows, lamps and of course, India Amory linens! Downstairs we have our working Shelley Johnstone Studio. This space houses our sourcing materials, fabric library and huge bulletin boards used for creating our inspirations. What are you currently coveting with regard to tabletop and tabletop design? I’m currently coveting Alberto Pinto’s Foliage Dinner plates and Buccellati Tahiti dinner service both timeless and beautiful. The table you designed for this year’s Veranda Magazine Orchid Dinner was absolutely divine! Can you walk us through the inspiration for your design scheme? My Veranda Magazine Orchid dinner table started with the Soane Tendril Vine botanical print fabric. The room is very busy so I knew I wanted to keep it simple by using mostly white with accents of green. I always mix things up when I set a table so I wanted the casualness of the rattan vases in the center of the table filled with formally arranged, elegant flowers to set the tone. It is always great to have a tier of taller flowers because of scale of the space. We used tall casual branches wired with white orchids creating a cascading umbrella feel. The rest of the table setting is easy, I added the white porcelain birds and white plaster candlesticks with green candles the day of the event. I truly find setting a table fun and relaxing…..
What drives your inspiration, in both your work and personal life? My clients and projects drive my inspiration for work. I’m very fortunate to work on some beautiful homes with incredibly kind people. My personal life is driven by my family. My husband and I are raising five amazing children together, my greatest gift is being a mom. My children and husband inspire me to create a beautiful home for us all to live in and enjoy! If you had to arrange a dinner table in a snap, what would you start with assembling? Every dinner table I set is usually in a snap….I have everything close by and organized in wonderful storage cupboards which makes setting a table inside and outside easy. It is always a mix of formal and casual and all my pieces work together. An easy place to begin is usually with the china. Mixing china and stemware keeps a table fun and interesting. 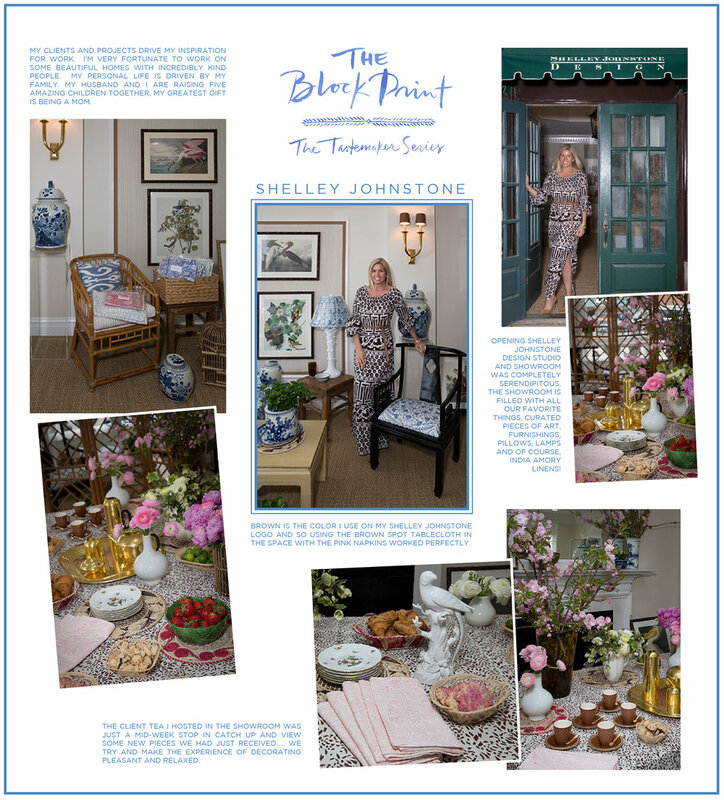 Most memorable pinch me moment to-date for Shelley Johnstone Design? Pretty great pinch me moment is walking with my dog over to The new Studio and Showroom and doing exactly what I love. We play good music, have fresh flowers and help people make their homes beautiful, pinch me! You seem to really be having a moment in the world of design. How did you get started? I was extremely fortunate to attend design school and work for a designer while living in London. This experience was priceless and taught me more then just formal training of scale and design but also about craftsmanship and bespoke curated details. The museums and homes I was exposed to were a visual feast, layered and stylish. I started Shelley Johnstone Design upon returning to the States and one of the benefits of living in a beautiful town like Lake Forest near a world class city like Chicago is that I’ve been able to work on important projects while raising our family. Now that the children are older I’ve been able to expand on that and really ramp up my business taking it to the next level. Favorite destination to getaway for a little R&R? Favorite destination for R&R: Capri is my favorite place if a special occasion and we have some time. Naples, FL is easy and I can really be low-key and relax but my favorite place R&R is my own backyard in the summer! Tell us about the client tea you hosted in your showroom. We love how you paired the pink and brown hues! The client tea I hosted in The Showroom was just a mid-week stop in catch up and view some new pieces we had just received….. We try and make the experience of decorating pleasant and relaxed. Creating a lifestyle that clients want to share in their own homes for their families and friends. Brown is the color I use on my Shelley Johnstone logo and so using the Brown spot tablecloth in the space with the pink napkins worked perfectly. Go-to (fashion) designer to wear at a dinner party you’re hosting? Go-to fashion designer at a home dinner party: I adore Wes Gordon who just took the reins from Carolina Herrera and also designer Andrew Gn.